A couple of weeks ago, my dear friend Christopher actually visited my blog (instead of viewing it through Google Reader) and noticed that my header was in need of a face-lift. (He created the previous one, so he’s allowed to say that!) He came over recently and created the new one while I prepared today’s recipe as a thank-you dinner. Many, many thanks to Christopher for my fresh new look. I love it! Anyway, both Christopher and I have a thing for pork, whether it’s shredded for tacos, part of a meatball, sauteed with sauce, or – for this meal – roasted with vegetables and drizzled with mustard gravy. This recipe has an amazing end result and is impressive enough for company; it certainly earned the C.Go stamp of approval. Preheat oven to 450°F. On a rimmed baking sheet, toss carrots, shallots, and 1 tablespoon rosemary with 1 tablespoon oil; season with salt and pepper. Roast for 10 to 12 minutes. Meanwhile, season pork with salt and pepper. In a large skillet, heat 1 tablespoon oil over medium. Add pork; cook, turning occasionally, until golden brown on all sides, 10 to 12 minutes. Transfer pork to a plate, and reserve skillet. Remove baking sheet from oven; push vegetables to sides. Place pork in center; return sheet to oven. Roast, tossing vegetables occasionally, until an instant-read thermometer inserted in thickest part of pork registers 145°F, 30 to 40 minutes. Loosely tent pork with foil. Let rest 10 minutes before slicing. While pork rests, pour off almost all of the fat from skillet. Add wine, and cook over medium-high, scraping up browned bits, until syrupy, 4 to 5 minutes. Add flour, and cook, whisking constantly, 30 seconds. Gradually add 1 cup water, whisking constantly. Add 1 tablespoon rosemary. Bring to a simmer. Remove from heat. Whisk in mustard, and season gravy with salt and pepper. 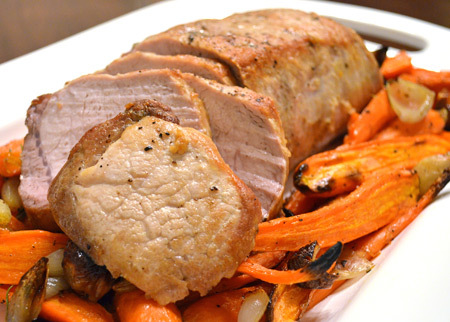 Serve pork with carrots and gravy. The smallest pork loin I could find at my grocery store was 2.7 pounds, so I bought it. Since my roast was large, I used the full 40 minutes of baking time. When I tested the temperature of my pork, it was more like 138° or 139°. I didn’t want to risk overcooking it, so I tented it then. I’m glad I did, because the pork turned out tender and juicy, and just barely pink. Peeling all those shallots was kind of a pain, though they are delicious. Christopher and I think it would be fine to use a small red onion (cut into wedges) or pearl onions as a substitute. I rounded out the meal with a simple side of green beans, and did we ever enjoy it all. The pork was perfectly cooked, the vegetables were tender, and the blackened bits on the vegetable edges were over-the-top delicious. We liked the rosemary in the vegetables but thought it was overkill in the gravy; next time, I’ll leave it out. Also, if you’re feeling a bit lazy, the meal would still be perfectly delicious if you skipped the gravy altogether. I enjoyed the extra flavor boost, though. This one’s definitely a keeper! 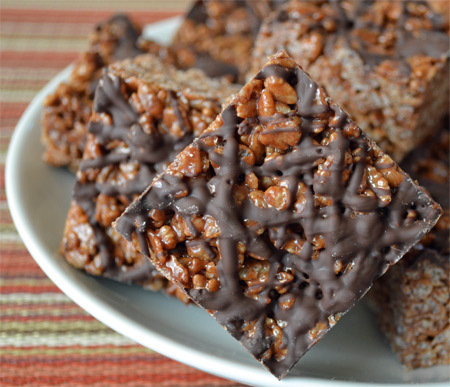 I initially hesitated to post this recipe because I knew it wouldn’t photograph very well, but what the heck? It’s too yummy not to share. I’m not usually one for recipe repeats (unless I’m entertaining), but I’ve made this dish twice in the past couple of weeks. Both times, I was motivated by the need to use an excess amount of spinach in my refrigerator. (I can’t pass up organic baby spinach at Costco since, at under $4, it’s less than the tiny containers I would get at the regular grocery store. A pound of spinach is a lot of spinach, though!) The first time was a test; the second time, I knew I’d be making something absolutely delicious. 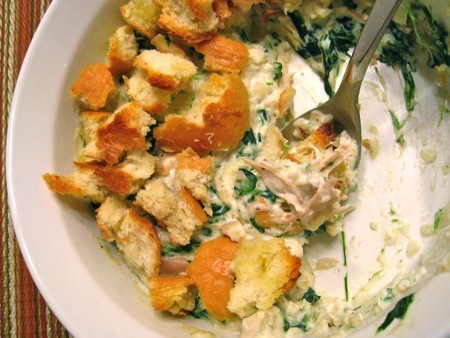 Think of this dish as creamed spinach with shredded chicken and fabulous, salty toasted bread on top. If that appeals to you (and it does to me! ), you’ll love this dish. I also enjoy that I get something super creamy that isn’t completely nutritionally devastating because the base is made with half-and-half instead of cream. Note: I baked this in a 1 1/2-quart Corningware dish, and I’ll admit that the amount of food the recipe produces isn’t huge. This is perfect for Dr. O and me to have dinner with enough left over for one person’s lunch the next day. If you wanted to serve four (or even six) adults, I would double the recipe. Also, be generous with seasoning during the cooking process. It makes all the difference. Despite the fact that it really doesn’t feel like fall has arrived here in Denver just yet (and I’m not complaining – this time last year, we’d already had a significant snow storm! ), I could no longer resist the urge to start cooking fall comfort food. 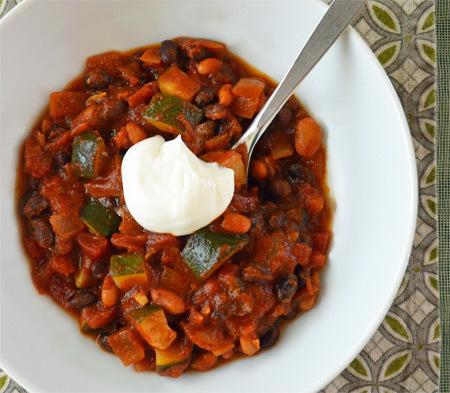 I love grilling and all the amazing produce summer has to offer, but I think fall – with its braised meats, soups, stews, squash, and all other kinds of warm, delicious things – might be my favorite cooking season. Heat a skillet over medium-high heat. Add 1 1/2 teaspoons oil to pan; swirl to coat. Remove sausage from casings. Add sausage to pan; sauté 3 minutes or until browned, stirring to crumble. Remove sausage from pan. Add 1 tablespoon oil to pan; swirl to coat. Add onion; sauté 3 minutes, stirring occasionally. Add mushrooms; sauté 4 minutes, stirring occasionally. Add garlic; sauté 1 minute, stirring constantly. Stir in sausage, 1/8 teaspoon salt, and tomatoes; bring to a simmer. Reduce heat to medium; simmer gently for 15 minutes. Bring broth and 1 1/2 cups water to a boil in a medium saucepan. Add polenta, stirring well. Reduce heat to medium, and simmer 20 minutes or until thick, stirring occasionally. Stir in remaining 1/8 teaspoon salt, cheese, and butter. Serve with sausage mixture. My grocery store was out of hot turkey Italian sausage, so I used sweet. I find that Cooking Light recipes rarely have enough salt for my taste, so I used 1/4 teaspoon of salt (1/2 teaspoon total) each time the recipe called for 1/8 teaspoon. On this same note, I just bought a regular old can of diced tomatoes (not no-salt-added diced tomatoes). I did buy fat-free, lower-sodium chicken broth as the recipe instructed. I used Bob’s Red Mill polenta. The recipe said to cook it for 20 minutes and the package suggested 30; I was happy with the consistency (for this particular meal, at least) at the 15 – 16 minute mark. Good heavens, this was delicious. I don’t know how the people at Jennie-O do it, but I never would have guessed that the sausage was made from turkey (as opposed to beef or pork) if I hadn’t cooked it myself. The spiced meat combined with the earthy mushrooms and the sweet tomatoes made a perfect sauce. And the polenta that soaked up that sauce? Holy cow. I’ve made polenta with butter and Parmesan many times before but never with cream cheese; the cream cheese really took it to the next level. I also appreciated that there was enough butter in the polenta so we could taste it, but not so much that it created a nutritional disaster. Each serving clocks in at nine Weight Watchers points so it isn’t exactly a lean meal, but it certainly tastes far more indulgent than it is. If I hadn’t told Dr. O this was a healthy recipe, he would have thought I was fattening him up for winter. 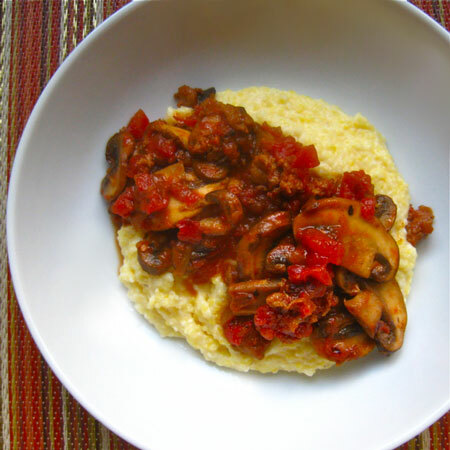 TIPS: Cook the polenta while the ragù simmers so everything will be done at the same time.